By Brian Cullen (BBC Studios) - images and text copyright © 1999. This AMT/ERTL was purchased three years prior to the re-release of the Star Wars® model line. I paid a hefty $35.00 for it, held on to it for seven years or so, and finally had the time to put it all together. Since the model is in two separate parts (bike and driver), I was able to concentrate on different assemblies at the same time. The subassemblies were built straight from the box, air brushed, and detailed by hand, then placed in trays for final assembly. 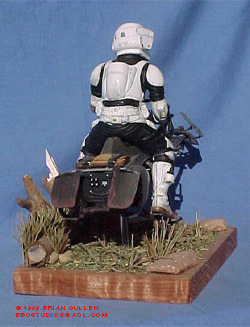 The only element to the model that was unimpressive was the bedroll attached to the rear of the bike. I created a new one with some old coffee and Elmer's Glue, a Scotty paper towel, and a couple of strips of lead foil for the straps. It really adds to the realism of the unit (as if it was real....). I also drilled out the laser cannon. The bike was assembled on a 3/16" plexi rod attached to the base. 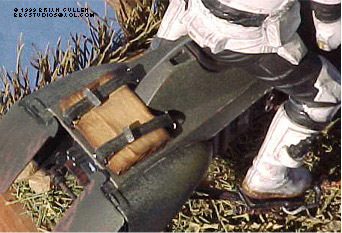 The rod was connected to the model via a hole in the bottom of the unit and an interior cap, which was positioned prior to matching the unit's halves together. The model was then decaled with old aircraft panel labels and weathered with pastels and red clay opaque. 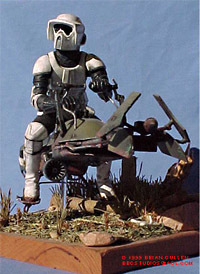 The final assembly of the bike was required prior to final assembly of the Imperial Speeder Dude since his realistic fitting rests on a number of variables: the angle of the foot pedals, the rear of the bikes saddle and his rear, and his left arm which holds onto the speeders handlebars. His right arm was re-positioned to hold a lever on the bike's control panel. 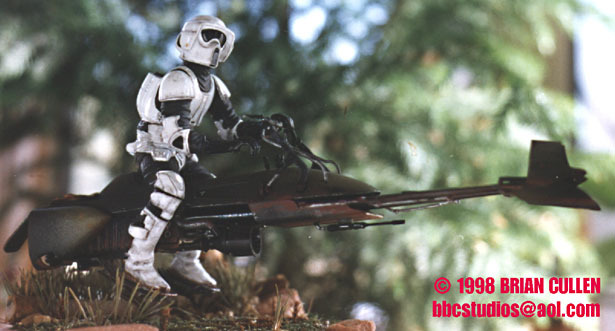 After watching films and videos on making the original movies, I recognized that the AMT/ERTL model's speeder dude sat on the bike as a four year old would: straight upright and rigid. In reality (whose reality?) they are depicted with their backs arched and their head held up while they "lean into" the bike. To better match a practical pose I cut the figure into three separate pieces and re-positioned the head, torso and lower section. I filled in and detailed the contours of the body with A+B Epoxy Putty and then attached the left arm (which would be the balancing/attaching part of the figure's top to the bike). His helmet was adjusted with a narrowed voice plate and grill plate and embellishments to his backpack unit. He was air brushed white gloss, flat black, gloss black, and his visor was enhanced with varnish for an ultra-gloss effect. He was weathered with pastels and red clay opaque on his boots. The base is a piece of scrap redwood and all the vegetation is from the floor of my old apartment and the model is kept aloft with a 3/16" plexi rod. It was a difficult model to build and I have seen some other model maker's enhancements that have blown my mind. This model is by far one of my favorites. Star Wars names, characters, images, and all related indicia are © and registered trademarks of Lucasfilm Limited. This page is not an authorized publication of Lucasfilms Limited and does not intend to infringe on any of their copyrights, trademarks, or publication rights. Please direct comments, questions, corrections, and picked nits to the Starship Modeler staff.